The ViziFrame Slim Digital Signage Appliance is sold ready-to-run with your name, company name, or organization name on the startup screen. It's ready to connect to just about any computer video monitor or flat screen TV with an SVGA port. 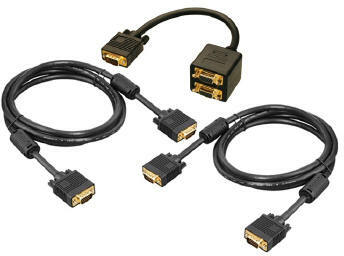 All ViziFrame Appliances come with a SVGA DB15 Male to Male cable for use behind wall mounted monitors, plus a short 10/100 CAT5 Network cable. Wireless 802.11B/G connectivity is standard. A USB Keyboard is required for initial setup of the ViziFrame Digital Signage Appliance. After that it will run unattended and without need of a keyboard or mouse. If you need a USB adapter for PS2 style keyboards, see our optional adapter below. A sample slide show comes installed with the appliance, and you can easily create your own slide show with advertising, menus, live web images, and video using the Windows based client program from any PC on your network. Setup time is usually 10 minutes or less. 1.6 GHz Intel Atom CPU, 1GB RAM, 160GB SATA Disk, Ethernet 10/100 port, 802.11B/G WiFi w/external antenna, SVGA DB15 port, 3x USB ports, Mic In/Line out audio ports, AC to DC power adapter, 18" SVGA cable, 24" Ethernet cable, Wall mount/VESA monitor mounting plate with screws, Quick Start Guide, and Windows control client and manual on CD ROM. #VZ-RM1 19" Rack Mount Unit ViziFrame 1.6 GHz Intel Atom CPU, 1GB RAM, 160GB SATA Disk, Ethernet 10/100 port, SVGA DB15 port, NTSC/PAL Composite and S-Video ports, PS2 keyboard port, 4x USB ports, Mic In/Line out audio ports, 36" SVGA cable, 24" Ethernet cable, 200 Watt power supply, 1x PCI expansion slot. For the ViziFrame Slim Digital Signage Appliance if you do not have a USB keyboard for initial setup. One ViziFrame Slim unit can run two flat screen displays simultaneously. 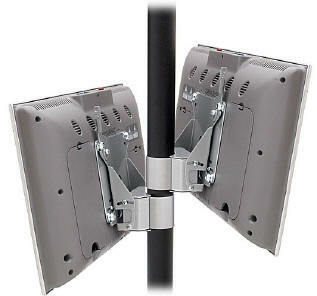 Useful for pole/column mounted systems with front/rear monitors facing opposite directions. Contains one SVGA splitter, plus two 36" SVGA cables (longer cables available on request). Monitors and mounting hardware shown below are not included, shown only for example. #VZ-SVGA-SPLIT ViziFrame 2x monitor adapter cable kit. national and regional satellite and radar, local radar, forecasts for Today, Tonight, Tomorrow, plus extended forecasts out to 7 days ahead, and local current weather. Customized with your company logo or brand name. WE ACCEPT PURCHASE ORDERS TOO! We accept purchase orders from qualified organizations such as schools, government agencies, and corporations. Warranty: All parts and labor for a period of one year from date of purchase, some restrictions apply. 2013 - ItWorks - ViziFrame is a trademark of Innovative Tech Works. All rights reserved.